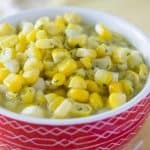 This recipe is an adaption of my childhood memories of creamed corn, combined with my love of the cilantro and lime flavor profile. Cut corn kernels off of 6 cobs – should yield between 4-5 cups. Break up corn into individual kernels. Add corn to pot. Then add water and salt. Lock lid and cook for 4 minutes at high pressure. Meanwhile – finely chop cilantro. Using a microplane – remove zest from 2 limes, then finely chop. Once cook time is complete, quick-release pressure and remove lid. Switch to sauté setting. Add butter, cilantro, lime zest, and cayenne pepper. Mix well until butter is completely melted. Make a cornstarch slurry by mixing cornstarch and 2 tablespoons of water. Pour cornstarch slurry into pot. Mix well, and continue mixing until desired consistency is reached. Probably about 1 minute. Switch to warm setting until ready to serve.